The 65.9ft-long FSD195 fast patrol vessel has a maximum speed of 50kt. Image courtesy of FERRETTI Spa. The FSD195 patrol vessel was launched in August 2016. Image courtesy of FERRETTI Spa. The FSD195 FPV is developed by Ferretti Security and Defence. Image courtesy of FERRETTI Spa. The FSD195 fast patrol vessel (FPV) was designed and built by Italian shipbuilder Ferretti Group’s subsidiary Ferretti Security and Defence (FSD), and was initially unveiled in February 2016. The FPV is intended for use by navies and coastguards in a number of mission applications such as maritime security, policing, counter-terrorism, and combating illegal drug smuggling. Ferretti Security and Defence demonstrated the FSD195 patrol vessel’s capabilities at the NAVDEX naval defence and maritime security exhibition in February 2017, which was held in Abu Dhabi, UAE. The patrol vessel is built in accordance with the FPV regulations set out by RINA SERVICES, a provider of marine classification and certification services based in Italy. An FSD195 demonstrator vessel was launched at Cattolica shipyard in the province of Rimini, Italy, in August 2016. Its initial sea trials were conducted in the same month to assess reliability and sea-keeping capabilities. The boat travelled from Cattolica to La Spezia, Italy during the sea trials, covering a distance of 1,750km under difficult weather and sea-state conditions. The FSD195 fast patrol vessel features a warped hull with a dead-rise angle of 17°. The hull, cockpit, main deck and internal structural frames are built using glass-fibre reinforced polyester (GRP) composite materials. Spray rails are fitted on the sides of the hull to provide additional lift, as well as keep the vessel dry. The overall length and hull beams of the FPV are 65.9ft and 16.5ft respectively. The vessel has a displacement of 38t when laden, and 31t when unladen. The boat is manned by four crew members and four operators seated in an enclosed navigation bridge located amidships. The bridge is equipped with large windows to provide a clear view of the surroundings. The FSD195 high-performance patrol vessel is armed with Leonardo’s Hitrole 12.7mm remotely controlled weapon station in the forward section. The gun can engage surface and air targets with a rate of fire from 450 to 500 rounds a minute. Up to two MBDA Marte Mk 2 anti-ship missile launchers can be fitted at the aft of the boat to defend fast manoeuvring surface targets. The FPV can also be fitted with a Rheinmetall armouring kit around the operative area for added protection against rifle firing. The FPV can carry a variety of navigational and radar systems to deliver safe and efficient operation at sea. A Skytech-designed BB50 Ka-band Telenor ultra-small antenna can be mounted atop the navigation bridge to provide high-speed internet access. The vessel also incorporates dual-band (Ku / Ka) satellite telecommunications terminals for satellite broadband internet. Seakeeper NG9 gyro stabilisers are installed on the boat to create comfortable operating conditions for the onboard personnel. FURUNO marine radars, including open-array radar sensor and a Radome sensor, are fitted on the antenna mast on top of the vessel, in order to detect and track targets at short and long ranges. The vessel is also equipped with a stabilised electro-optical (EO) tracking system, which consists of a laser rangefinder, an optical sight and an infrared camera to provide surveillance, reconnaissance and target acquisition in all-weather and day / night conditions. "The overall length and hull beams of the FPV are 65.9ft and 16.5ft respectively. The vessel has a displacement of 38t when laden, and 31t when unladen." FSD195 is powered by two MAN V12-1900 high-speed four-stroke marine diesel engines, each delivering an output power of 1,900hp. The V12-1900 engine was developed by MAN Truck & Bus subsidiary MAN Engines, and has 12 cylinders arranged in 90° V design. The propulsion system also comprises Top System TS 85 surface drives, which produce a maximum power of 1,600hp at 1,300rpm. The FSD195 patrol boat offers a maximum speed of 50kt at 1 / 3 load conditions. It can travel for a range of approximately 800km. This project forms part of our recent analysis and forecasts of the global naval surface combatants and warfare systems market, available from our business information platform Strategic Defence Intelligence. For more information click here or contact us: EMEA: +44 20 7936 6783; Americas: +1 415 439 4914; Asia Pacific: +61 2 9947 9709 or via email. 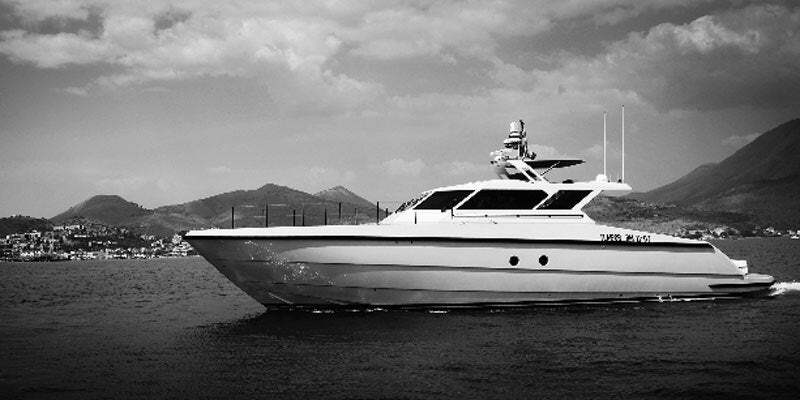 Since 1974, Rodman Polyships has designed and constructed Glass-Reinforced Plastic (GRP) and composite-material fast patrol boats and fast patrol vessels for naval, maritime surveillance and maritime law enforcement applications.